Like its name suggests, the Trans Missouri Division of the Pacific Coast Extension crosses much of the territory defined by the large, meandering river. 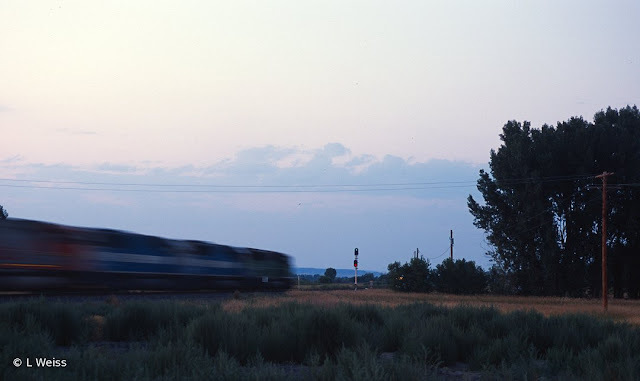 1118 miles from Chicago, the Resourceful Railroad enters Miles City, MT. In better times, it was the location of division offices with large yard and maintenance complex - the first encountered out along the PCE. In other times, it was the original start point for the Lines West embargo of 1980. Never far away in these parts of the plains is the old NP, the first line to strike out for the Northwest Coast. It is still active today and lends the sounds of diesel prime movers and whistles to the local community despite the Milwaukee's lasting absence. Below, west bound coal rolls through the eastern edge of Miles City behind a quartet of EMD products that reveal the continually changing landscape of railroading in general.